so about that new book theres some bits that were already translated; ill keep posting here if i find anything else. Though the main story begins in the year 756 of the modern era (M.E. ), the world’s history has been recorded for over 2,000 years, and its contents are essential for a deep comprehension of the story. 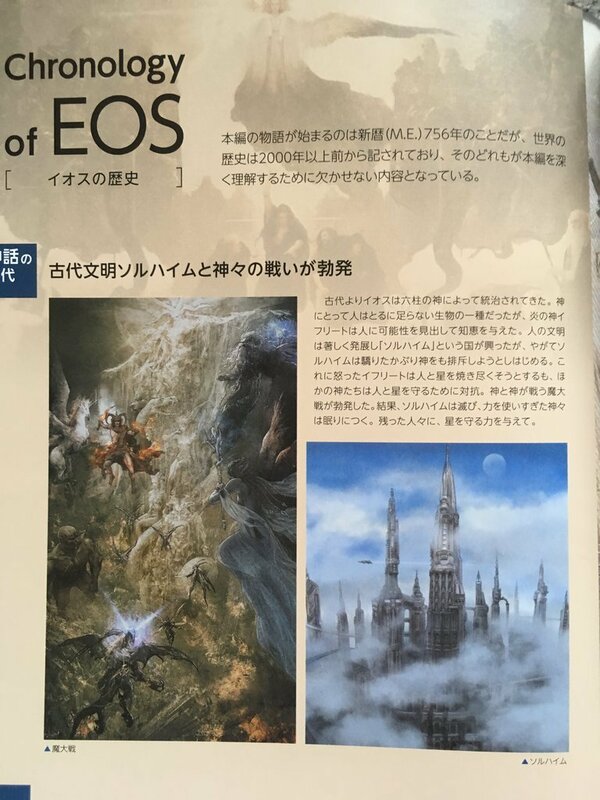 Since ancient times, Eos was ruled by the Hexatheon. Though in the eyes of the gods men were insignificant creatures, Ifrit the Infernian saw potential in humanity and granted them knowledge. Human civilization advances remarkably and gives rise to a kingdom called Solheim, but in time Solheim grows proud and begins an attempt to repudiate the gods themselves. Ifrit in his rage would have burned man and planet both to ash, however, to protect the people and planet, the other gods oppose him. A great war broke out between gods. In the end, Solheim lies in ruins, and the gods, having overextended their powers, fall into slumber. To the surviving humans, they grant the power to protect the planet. An illness caused by plasmodium parasites spreads, and the world’s population decreases dramatically. A personage from the clan that had been given power by the gods began to treat the plague with a unique ability, but as a result the illness came to abide in his own body. Though this person was originally meant to be chosen as King by the Crystal given by the gods, because of the sickness residing in him, he was rejected by the Crystal and the throne went to his younger brother. In the interval from 2000 years ago to 755 years ago (M.E. founding year), several major countries besides Lucis were established. Tenebrae, governed by the Fleurets, the family carrying the blood of the Oracle who, like the King of Lucis, was granted power by the gods. The island country that flourished by trade with other nations, the United Free Cities of Accordo. And the Empire of Niflheim, that used relics of Solheim to rebuild a magitek civilization. Lucis, Tenebrae, Accordo, and Niflheim became the four great nations ruling the world. In the course of relations with one another, in order to aid communication, the four great nations established a common calendar. This moment was designated the First Year M.E., and as the nation’s civilizations intermingled, human history made rapid progress. However, differing ways of thought gradually gave rise to friction between the nations. Niflheim’s ruling Aldercapt family employed artifacts from Solheim to develop military power, and came to the belief that it was proper for the Empire connected to that ancient civilization to take control of the world. They desired the powers of the gods that abided in Lucis and Tenebrae in order to realize that control, and in 358 began a war of aggression. Circa 359, Tenebrae was easily driven to surrender. However, Niflheim refrained from pushing out the Oracle, who the people revered, and did not attack the residence of the Fleuret family, Fenestala Manor. Though they had previously restrained their war of aggression to attacking only the adjacent Tenebrae, in time the Empire of Niflheim gained further military might and crossed the sea to wage war against Lucis and Accordo as well. 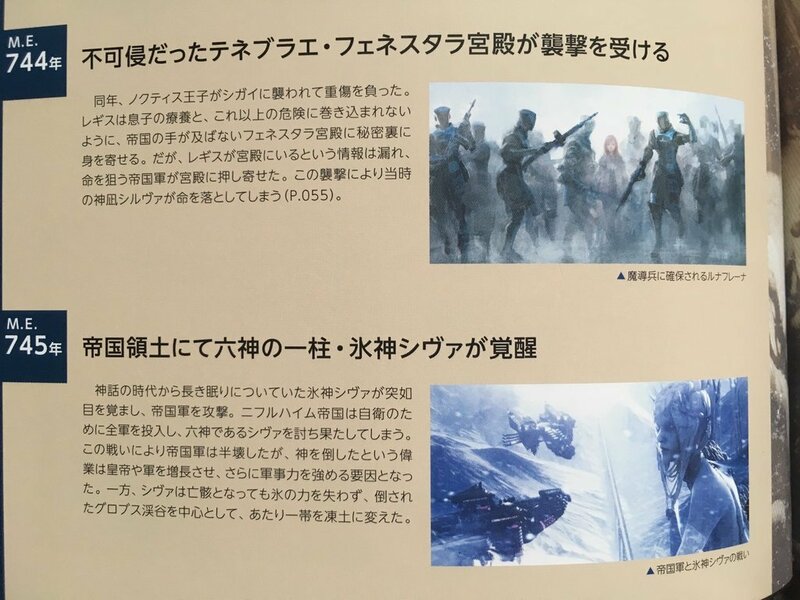 Lucis and Accordo, who could fight only with people of flesh and blood, were overwhelmingly outclassed by the Empire’s Magitek-Armor-centric weaponry. Accordo surrendered, and the King of Lucis raised a magical wall and prepared for a siege. While recognizing Accordo’s self-governance, the Empire constructed bases outside of Lucis’s wall, where they stationed the army and took effective control of the area. Unable through the long years to break down the wall of Lucis, the Empire, in search of further military might, developed Magitek Infantry. This was at the proposal of Ardyn Izunia, who had entered the country the previous year, with the mass production system being completed under Chief Verstael Besithia of the Research Institute. 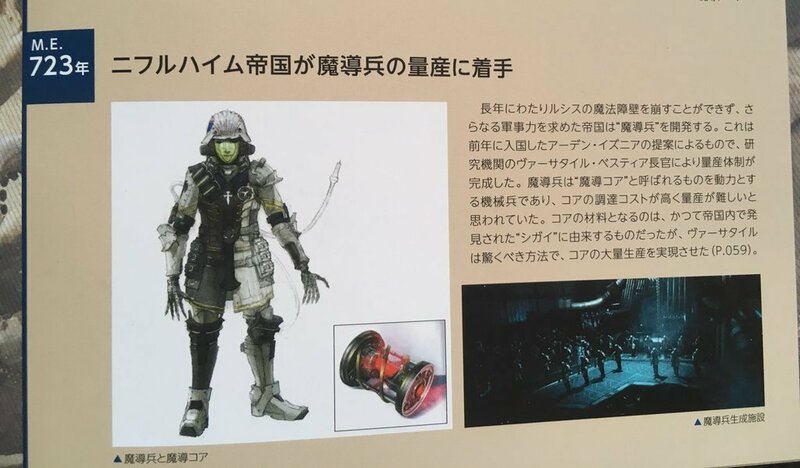 The Magitek Infantry were mechanical soldiers powered by objects called Magitek Cores, which, due to high requisitions costs, were thought to be difficult to mass-produce. Though ingredients for the Cores were formerly derived from the daemons that had been discovered inside the Empire, through an astonishing method, Verstael achieved the Cores’ mass production (P. 059). In this year, Regis received a revelation from the Kings of Yore and was told that his son Noctis would become the chosen king. That is, the king chosen by the Crystal to stand against the legendary Calamity to Come. The one whose mission would be to sacrifice himself to save the world from disaster. Even while in anguish over Noctis’s fate, Regis decided to create a force under his direct command to protect his son. From the ranks of those who had been driven from their homelands by the Empire’s invasion, he gathered people with a high capability to adapt to the royal family’s magic and established the Kingsglaive. The Glacian Shiva suddenly awoke from her slumber since the Age of Legends and attacked the Imperial Army. In self-defense, the Niflheim Empire mustered the entirety of its forces and slew the goddess. Though the army was half destroyed in the battle, the feat of killing a god emboldened the hubris of the Emperor and the military and became a source of further martial strength. However, Shiva did not lose her icy powers even as a corpse, and the region centering on Ghorovas Rift where she fell was turned to tundra. Four years after the Oracle Sylva perished, her daughter Lunafreya ascended as the new Oracle. From childhood Lunafreya had been told her duties by Gentiana, a messenger of the Six Gods, and at the tender age of 16 she showed her resolution and traveled the world performing the Oracle’s office. The majority of this work was the salvation of people beset by illness in each region. This became to no small extent a burden on the Oracle herself, yet Lunafreya did not cease her journey. After roughly ten years had passed, the long-lost Prince Noctis returned. Having awakened as the True King who wields the power to drive out the darkness, the prince heads toward the Crown City Insomnia with his former companions. Against them stands he who has for 2,000 years lived for nothing but revenge on the Crystal and the True King: Ardyn Lucis Caelum. Sometimes exploiting the Empire and hastening the coming of the calamity, sometimes helping the prince and encouraging his awakening, he worked in the shadows behind the scenes of history solely to fulfill his own revenge. There are no witnesses to the outcome of the decisive battle between the true king Noctis and the false king Ardyn. However, not long afterwards, dawn broke over the world. The tale of the True King’s deed will be passed down forevermore. 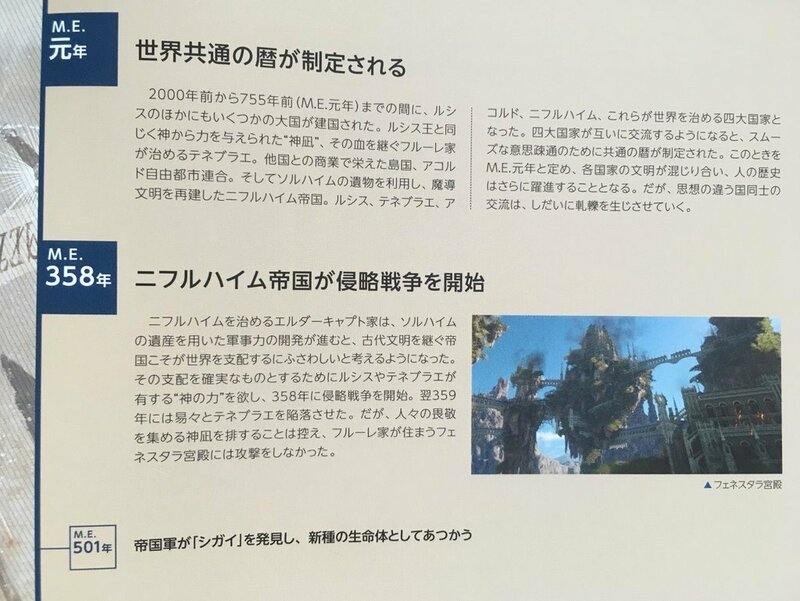 The Extra Chapter shown in Episode Ignis. With but one decision, Ignis’s powerful desire to save Noctis finds another possibility. In the midst of the pitched battle in Altissia, Ardyn draws a blade on the fallen Noctis and provokes Ignis. Will Ignis die with the rest here, or will he alone come with him? Finding a glimmer of hope in this inscrutable question, Ignis decided to go along with Ardyn. Ardyn summons Ignis to Zegnautus Keep, where he reveals that he is a member of the royal line of Lucis who was driven from the throne, and that his goal is to have his revenge by killing the awakened True King Noctis. Along with the fact that to encourage the king’s awakening, he means to make sport of killing Ignis. Though wounded all over his body by Ardyn’s attack, Ignis has no intention of dying there. 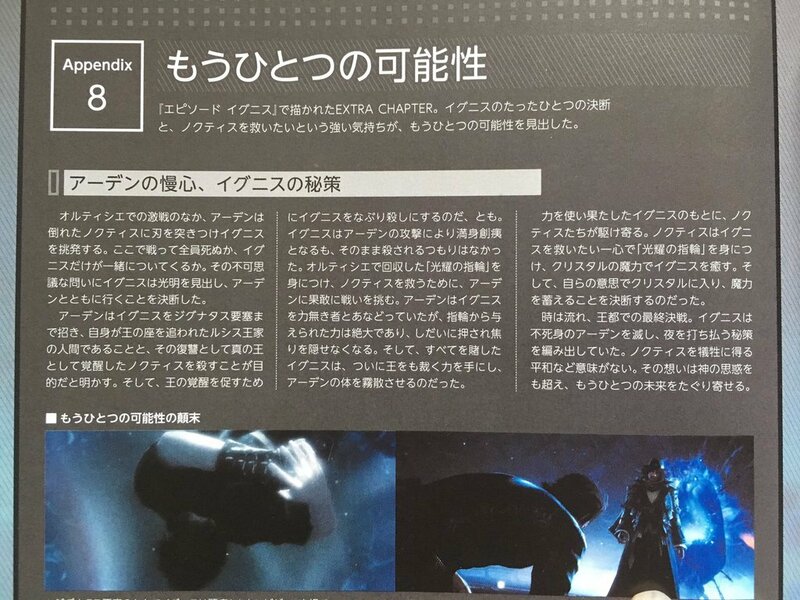 He puts on the Ring of the Lucii that he recovered in Altissia and, to save Noctis, boldly challenges Ardyn to battle. Ardyn had disdained Ignis as helpless; however, in the face of the immeasurable power granted by the ring, he is gradually pressed into becoming unable to hide his vexation. Then Ignis, having wagered everything and finally obtained the power to bring judgment on even a king, disintegrates Ardyn’s body. Noctis and the others rush to Ignis, who has exhausted his powers. Desiring heart and soul to save Ignis, Noctis puts on the Ring of the Lucii and heals Ignis with the Crystal’s magic. Then he entered the Crystal of his own will, resolving to accumulate its magic power. Time passes, and the final battle in the Crown City arrives. Ignis has been devising a secret plan to destroy the immortal Ardyn and drive out the darkness. There is no meaning in a peace obtained by sacrificing Noctis. His emotion surpasses even the intent of the gods and brings forth another future. 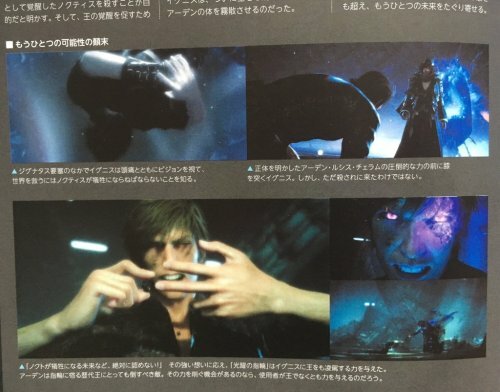 Top left photo caption: In Zegnautus Keep Ignis gets a vision along with a headache, and learns that to save the world Noctis must be sacrificed. 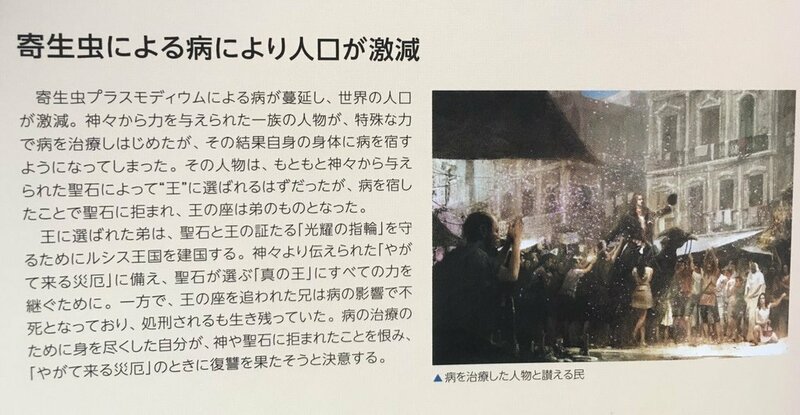 Top right photo caption: Ignis on his knees before the overwhelming power of the revealed Ardyn Lucis Caelum. However, he did not come all this way just to be killed. Lower caption: “But I refuse to let Noct sacrifice his life to save ours. I won’t let you take him away!”* In response to this fierce emotion, the Ring of the Lucii grants Ignis the power to surpass even a king. To the Kings of Yore residing in the ring, Ardyn is a enemy who must be defeated. If there is the opportunity to diminish his strength, they may grant power even to a user who is not a king. At the Crown City Insomnia. On the path to the final battleground, Ravus awaits. 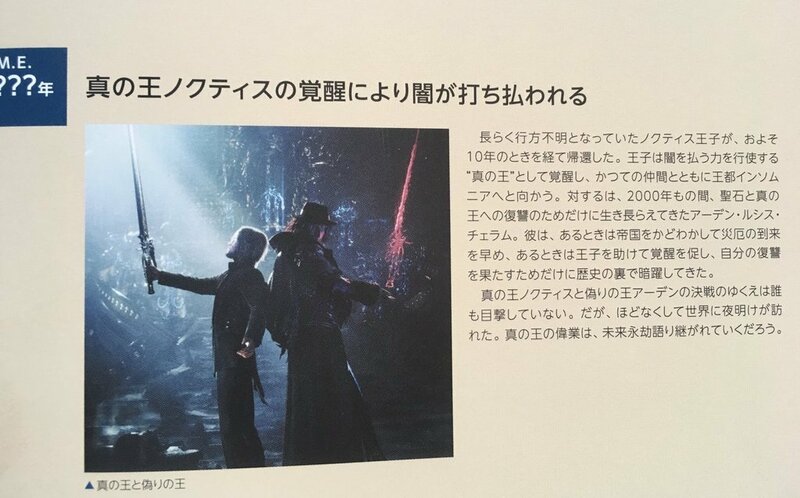 Ravus, recognizing Noctis as the True King, entrusts him with the weapon of the final King of Yore: his father’s sword. Ravus joins them and the party heads towards the Citadel, expressions bright, appearing confident of the secret plan’s success. Funny since technically speaking, Ardyn is the True/Original King. He's not false. He was cast aside. False is someone of another family name swooping on out of nowhere and claiming to be a Lucis Caelum. If anything, Somnus and his descendents thereafter are the "false" ones lol. I wonder how he was executed? Hanging? Stoning? Locked in a cellar to starve? The only clue we have is the concept art of him hanging by his arms and people trying to cop a feel of him. Thanks @Storm for finding this. My theory on Ardyn's execution is that he was brought to Angelgard for judgment-by-Ramuh and kept for a time In the cell where Noct awoke after his ten year sleep. There's gotta be a reason why they gave us that detail, and adding yet another recapitulation between Ardyn and Noct's stories is an ideal one.